Well, its been one week since most kiddos went back to school or started school for the first time. This time of the year can be filled with so many mixed emotions for both the children and the parents. The kids may have fear and excitement wrapped in one. The parents might feel sad about how quickly their kids are growing up mixed with the fondness of the memories they have from their school days. I don’t have kids yet so I’m solely focused on my memories. I remember my first day of Kindergarten very well. I remember being so excited to go to school. See, I didn’t go to preschool or daycare so this was my first experience of some sort of schooling besides my sister teaching me after school (which is a great memory in itself). I remember making friends quite quickly. Ashley, naturally because our names were so similar. Olivia who I reconnected with in high school. Sarah who I saw later during summer school after fifth grade for extra reading practice. Lastly, Aly who became my best friend since we realized we went to the same church. Unfortunately, I don’t have contact with these friends anymore. We lost touch greatly because I went to a private school after Kindergarten. I lost my first tooth on the second day of school while in line to get into the classroom. I was so scared because I didn’t know it was going to bleed that much! My first school Halloween was a memory that scared me for a while. Our principal was dressed in a very scary prisoner and was chained on the roof screaming. I remember on my birthday, I brought my first birthday treat. I got off the bus with Ashley. She decided we should “walk-run,” and I tripped and dropped the container with the cookies. I was so upset that my birthday treat was ruined. I remember having a 6th grade reading buddy whose name was Adam. When I went to the private school, so many teachers made an impact on my learning experience. I’m actually friends with three of them on Facebook, and I still look to them for inspiration and guidance. These women are part of the reason why I like working with children so much. In this education, like Laboni mentioned in the video, they also learn about Jesus which follows the instruction of Proverbs 22:6. 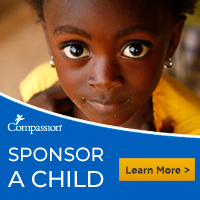 If you want to learn more about sponsoring a child, follow this link. If you’re ready to sponsor a child, follow this link and start this beautiful relationship with a child today!